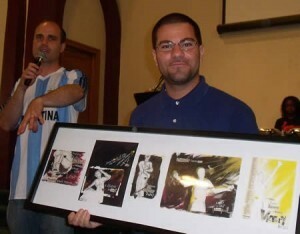 Brent Saba displays his painting, a going-away gift from Urban Hope. After three years at Urban Hope in Philadelphia, Brent Saba has resigned from the ministry. He feels that God is leading him to continue seminary education so he can be more knowledgeable in the Bible. The church celebrated his years of ministry by having a reception and a going-away gift—a painting done by Ashli Moon from Urban Hope.